Movement: 6206, SEIKO Suwa factory, Auto-winding, 26 jewels. I can not open the caseback, too tight, no picture of the movement. Glass: Original, acrylic, many cracks. It fits for wrist of 17.5 cm or less. Day/Date: Works fine automatically also manually (semi quick-set), English. It does not run, for parts, for repair. For practical, everyday use, it would be advisable to have the movement cleaned and oiled. It is described on page 7, 38 of the book Japan Domestic Watch Vol. 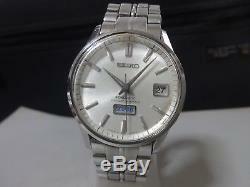 5 - SEIKO Automatic watch. The item "Vintage 1965 SEIKO Automatic watch Seikomatic Weekdater 6206-8040 for parts" is in sale since Tuesday, October 23, 2018.